As we celebrate the 50th anniversary of In re Gault this month, it is a great opportunity to take stock of how far we have come and where we stand on juvenile justice issues in North Carolina today. In re Gault enshrined in American jurisprudence an important due process “floor” for juveniles by recognizing that they have at least the same due process rights as adults in our criminal justice system. As a result, juveniles today are receiving more due process protections in our courts. North Carolina’s juvenile justice system also has made numerous reforms over the past two decades and is more focused on rehabilitation than it has been ever before. This means that more young people are getting set back on track and held accountable for their actions without having their lives upended and their futures put at risk. It also looks like 2017 may be the year that North Carolina joins the rest of the country in “Raising the Age.” As of last month, North Carolina became the last state in the country that automatically prosecutes both 16- and 17-year-olds as adults, no matter how minor the offense. The data on our current approach consistently shows that it leads to worse outcomes, makes our communities less safe, and costs taxpayers more. Disability Rights NC cares about this issue because a significant number of the youth in our criminal justice system have disabilities. Moreover, children with disabilities already have a hard enough time accessing housing, education, and employment during those crucial transition years into adulthood and beyond. When we further saddle those children with the 1,000 “collateral consequences” of having an adult criminal record and the trauma of incarcerating them with adults—where they are significantly more likely to be physically or sexually victimized and manipulated by gangs—we set those children up for failure. It increases their future reliance on government assistance and makes it more likely that they will resort to future criminal activity and re-enter the criminal justice system. That ends up costing North Carolina taxpayers even more in the long run and has serious repercussions for families throughout our state. We are privileged to be part of a broad coalition focused on Raising the Age this year—including the North Carolina courts, the North Carolina Office of the Juvenile Defender, law enforcement, and stakeholders in every corner of the political spectrum. 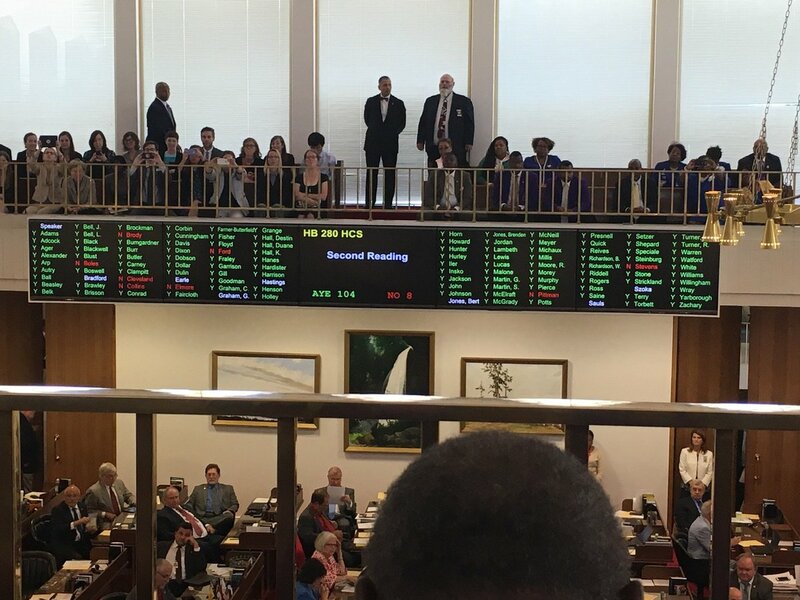 We are working to support the Juvenile Justice Reinvestment Act (HB280), which would Raise the Age to 18 in North Carolina for all but the most serious, violent felonies. It would keep 97% of the youth who get mixed up with the law in the juvenile system and get our kids the supports they need to grow into successful, contributing members of society. That bill passed the North Carolina House last week with overwhelming support. It now moves on to the Senate, where we will continue the work of bringing meaningful change to North Carolina’s youth. Young people in our criminal justice system, and particularly those with disabilities, are the most vulnerable defendants in our criminal justice system. That will never change. Nor will the fundamental truth that the law is at its most when it protects the least of us. If there is one lesson we can learn from working with these kids—whether through protecting their basic rights, making practical reforms to focus on rehabilitation, or recognizing under the law that they are, in fact, children—it is that there is always room for more justice. Matthew Herr is an attorney and policy analyst with Disability Rights NC. Follow him at @MattHerrTweets. Jonathon Woodruff is a 23-year-old native of Winston-Salem, N.C. He moved to Durham, N.C. to attend North Carolina Central University and graduated with a B.A. in Psychology. Jonathon then moved to Raleigh, N.C. and enrolled at Campbell University School of Law. He is a rising 3L student and will serve as the President of the Black Law Student Association and a 3L Representative to the Student Bar Association this upcoming year. Jonathon has previously interned with Attorney Louis Woodruff and the Wake County Family Court. He desires to practice in both criminal defense and family law. It’s been an eventful week for our office and just to keep everyone in the loop on what’s been going on, we’ve prepared a quick summary of the excitement for you here! Monday, May 15, was the 50th anniversary of In re Gault. Our office hosted a successful Twitter Town Hall with the help of representatives from the Administrative Office of the Courts, the N.C. Advocates for Justice, ACLU, the Council for Children’s Rights, the N.C. Bar Association, the Office of the Appellate Defender and others. During the event we discussed what it means to fulfill the promise of Gault and the need to raise the age of juvenile jurisdiction in N.C. Governor Roy Cooper also chimed in using our hashtag, #Gault50NC, and his tweets for were listed several times on the top tweets in NC! Prior to the Twitter event, our office also debuted our video discussing Gault and Raise the Age on social media. The video stars Communications and Office Manager Marcus Thompson and was created in collaboration with Chris Mears of AOC. Juvenile Defender Eric Zogry also attended the Gault at 50 Gala in Washington, D.C that evening. During the gala, Eric met with many other leaders in juvenile defense from across the country. The National Juvenile Defender Center also released its report titled Access Denied: A National Snapshot of States’ Failure to Protect Children’s Right to Counsel, highlighting the shortcomings of states across the country in fulfilling the promise of Gault. On Wednesday, House Bill 280, the Juvenile Justice Reinvestment Act, had its second hearing in the House. Rep. Chuck McGrady, Rep Marcia Morey, and others stood to voice their support of the bill. Arguments made in favor of the bill addressed the need to protect youth from physical assault in adult prisons, higher rates of recidivism among youth incarcerated with adults, the suffering of youth with disabilities in the justice system, and youth being imprisoned in the criminal system for crimes as simple as littering or performing harmless pranks. Rep. Larry Pittman and others did stand to voice their concerns and opposition to the bill. Pittman asked fellow representatives to forget that N.C. was standing alone in keeping 15 as the maximum age for juveniles, and “not to go easy on offenders based on age”, but to consider the victims of their crimes instead. Some representatives only proposed that the bill be amended to include F-I felonies and other minor changes, but still voiced their support for raising the age. Concerns about recurring gang activity among youth who are given too much leniency in juvenile court were also brought up. The most common point of opposition seemed to be about the budget. In closing, McGrady addressed the opposition, saying that there is a budget in place and pointing out that there were more people complaining about the costs than the law itself. In the end, the bill was passed in a 104-8 vote! We want to celebrate these successes and also look for more opportunities to improve the juvenile justice system in N.C. There are still plenty of training events scheduled for the remainder of the year, more work to be done in the protection of children’s rights, and a lot of preparation for when N.C. finally raises the age. Let’s continue gaining more successes and let us know your thoughts for what could be done going forward! In 1964, Gerald Gault was ordered to serve nearly six years in a state industrial school for allegedly making a prank phone call. His adjudication was based upon a confession obtained without his parents or a lawyer being present and without advising him of the right to remain silent. The Arizona courts decided that such formalities (i.e., the advisement of rights and participation of lawyers and parents) were unnecessary in juvenile court where the goal was treatment and not punishment. The U.S. Supreme Court disagreed. Gault also extended the Miranda rule to juveniles, requiring law enforcement officers to advise juveniles in custody of their Fifth Amendment rights prior to any questioning. Under the Miranda rule, statements made by a juvenile while “in custody” are inadmissible in court unless Miranda warnings were given and the juvenile knowingly and voluntarily waived the juvenile’s rights. The Gault court recognized that “special problems may arise with respect to waiver of the privilege by or on behalf of children,” but did not establish any specific requirements for such waivers. Id. at 55. As a result, state laws vary significantly with respect to whether and how juveniles may waive their rights and whether they must do so in the presence of a parent or an attorney. Notice to Parents When a Juvenile is in Custody. When a juvenile is taken into temporary custody by a law enforcement officer without a court order, the officer must notify the juvenile’s parents and inform them of their right to be present with their child until a decision is made as to whether continued custody is necessary. G.S. 7B-1901(a)(1). Advisement of the Right to Parental Presence During Custodial Interrogation. In NC, juveniles under the age of 18 are entitled to have a parent present during a custodial interrogation. Thus, before a law enforcement officer questions any juvenile who is in custody, the officer must advise the juvenile of the following rights: (1) that the juvenile has a right to remain silent; (2) that any statement made by the juvenile can be used against him or her; (3) that the juvenile has the right to have a parent, guardian, or custodian present during questioning; and (4) that the juvenile has the right to an attorney and that one will be appointed if the juvenile is not represented and wants representation. G.S. 7B-2101(a). When officers fail to give these warnings, any statements made by a juvenile while in custody are inadmissible in court. In re K.D.L., 207 N.C. App. 453 (2010). No Waiver of Rights by Juveniles Under Age 16. NC law now requires that when a juvenile is under the age of 16, a parent or an attorney must be present during the custodial interrogation in order for the juvenile’s statements to be admissible in court. Also, if an attorney is not present, both the parent and juvenile must be informed of the juvenile’s rights; although, only the juvenile can waive his or her rights. G.S. 7B-2101(b). Advisement of Rights When Accepting Juvenile’s Admission. A trial court may only accept a juvenile’s admission (i.e., guilty plea) after personally addressing the juvenile to make six mandatory inquiries, including informing the juvenile that the juvenile has the right to remain silent and that anything the juvenile says may be used against him or her. G.S. 7B-2407. Because there is a greater duty to protect the rights of juveniles in juvenile proceedings, the court’s failure to address even one of these mandatory inquiries is reversible error. In re T.E.F., 359 N.C. 570 (2005). Advisement of Rights When Juvenile Testifies. In order to comply with the mandate in G.S. 7B-2405 to protect a juvenile’s privilege against self-incrimination, trial court judges must advise juveniles of the right to remain silent before allowing the juvenile to testify in his or her own delinquency proceeding. In re J.R.V., 212 N.C. App. 205 (2011). Requiring the advisement of these warnings prior to interrogations by law enforcement and before a juvenile enters admissions in court increases the likelihood that juveniles will understand their rights and will have an opportunity to exercise them. However, potential barriers may still exist. Some advocates argue that these statutory protections do not go far enough, if juveniles cannot fully understand their rights or effectively assert them. According to this article in the ABA Journal, most youth find Miranda rights to be confusing, and nearly 90% of them waive their rights without understanding the consequences. Another potential barrier to juveniles exercising their rights is the requirement that juveniles must satisfy adult legal standards to trigger their rights under Miranda. Until six years ago when the Supreme Court decided J.D.B. v. North Carolina, police officers applied a “reasonable adult” standard to determine when they must advise a juvenile of Miranda and juvenile rights. J.D.B. held that the Miranda custody test must account for a child’s youth and its unique characteristics. However, recent appellate decisions reveal that courts have not significantly changed how they apply the Miranda analysis to interrogations of juveniles (see this bulletin addressing the reasonable child standard). Advocates also argue that juveniles should not be allowed to waive their rights without the assistance of a parent or attorney. North Carolina law, by requiring the presence of a parent or attorney during custodial interrogations of juveniles younger than 16, implicitly recognizes that children lack the capacity to understand their rights without a helpful adult. Despite this protection, juveniles continue to face barriers when attempting to invoke their rights. In 2015, the NC Court of Appeals held in State v. Saldierna that a 16-year-old possibly attempted to invoke his right to have a parent present during a police interrogation when he asked the detective if he could call his mother, which triggered a requirement that the interrogating officers clarify his statement before proceeding. However, last December, the NC Supreme Court reversed the decision. It held that a juvenile must clearly and unambiguously invoke the statutory right to have a parent present during a custodial interrogation, just like an adult must do to invoke Miranda rights. State v. Saldierna, __ N.C. __, 794 S.E.2d 474 (2016). A prior blog post discusses why the Supreme Court’s decision possibly conflicts with J.D.B.’s mandate that police officers and courts must account for the special vulnerability of juveniles during police interrogations. Despite these potential barriers, significant progress has been made in the fifty years since Gault, especially in North Carolina. Let us know your thoughts about additional ways courts can better protect a juvenile’s rights. For more, please check out the other pages on the Gault at 50 series on this site and the “On the Civil Side” blog by Professor LaToya Powell.